I was on the set yesterday of FiLMLaB’s “Unwelcome Guests” by Jon Dragt. It was my first FiLMLaB film set—actually, my first film set ever, and it was amazing. Fantastic. Fun! Quite honestly? I loved it. Granted, I wasn’t hauling any equipment, dealing with the drastic changes in sunlight, the rain, stressing over prop malfunctions and rehearsal time, or wondering if this really was the best way to introduce the new character to the scene. I especially didn’t have to deal with noisy producers on the set. Mainly because I was one of those noisy producers (embarrassingly enough…). Eek! But FiLMLaB Executive Producer Ruth Witteried was on hand to answer all of my questions, make sure that I could see the scene and the camera and what the director was watching, and pretty much let me immerse myself in the whole experience and made the whole day fun for me. The cast members were incredibly professional and seemed so easy to work with. Dennis Fitzpatrick (of The Proposition fame–a fascinating film featured at 2012’s FiLMLaB Awards in which he plays one of the creepiest pervs ever in the most awesome way ever) played Curt, and the gorgeous Priscilla Prosser was Fiona. Paige McKenzie (The Haunting of Sunshine Girl) played Sophie (and had some of the most hysterical tweets and photos from the set that day), while her friend Tyson Dailey played Matt. The chemistry between the two of them was so fun to watch, and they managed to laugh throughout the whole process, even when the day seemed to go on forever. The crew couldn’t have been better. Martin Vavra of Galaxy Sailor Productions was the director. He was so calm and collected on set–dealing with any issue that came up with grace, talking the actors through their scenes, and generally being an awesome guy. He may have, at one point (OK, two–at two points! ), come to speak firmly with myself, Alina Blankenship (the home owner, who was awesome enough to let FiLMLaB take over her house for the day), and Ruth Witteried because we were being noisy and talking while they were rolling. He did it in a nice way, but was still very clear that he was through with our shenanigans and that we needed to be quiet. We’re sorry, Martin! Again! I thought he summed it up perfectly when he came in for a break about halfway through the day. Ruth and I asked him how it was going. He grinned, shrugged, and said, in a very Zen way, that, “Things have gone wrong. But things always go wrong.” And then he went back to work. Alyssa Roehrenbeck of Sound Skript Entertainment was the Assistant Director and arranged everything beautifully and flawlessly. She, like Martin, never seemed to get flustered either, even though I’m sure there were times when she wanted to scream. I got to see Donn Eaton-Quist again from Conception Artistry Make Up & Hair, who worked on Coffee, Table, Book during last year’s FiLMLaB. She had to be on set at 6 am. 6 am. And she didn’t leave until it was a wrap, at 6 pm. 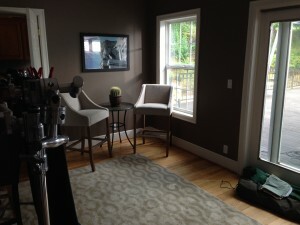 Jason Ball turns a West Linn home into a beach house! I met Jason Ball, an interior designer who offered to help out with the set designs. He not only turned a house in the hills outside West Linn (during the middle of a thunderstorm no less!) into a beach house owned by art collectors, he also reset the scene when the take didn’t work, and moved furniture around. He even vacuumed at one point. Didn’t hurt that he was freaking hysterical and a blast to hang out with. He was a newbie on the set, too, so we could get excited about the same things together. And, of course, Jon Dragt, our FiLMLaB Script to Screen Competition winner for 2014 was there. Jon’s special simply because he’s the first screenwriter who was able to be on set for the making of his film. 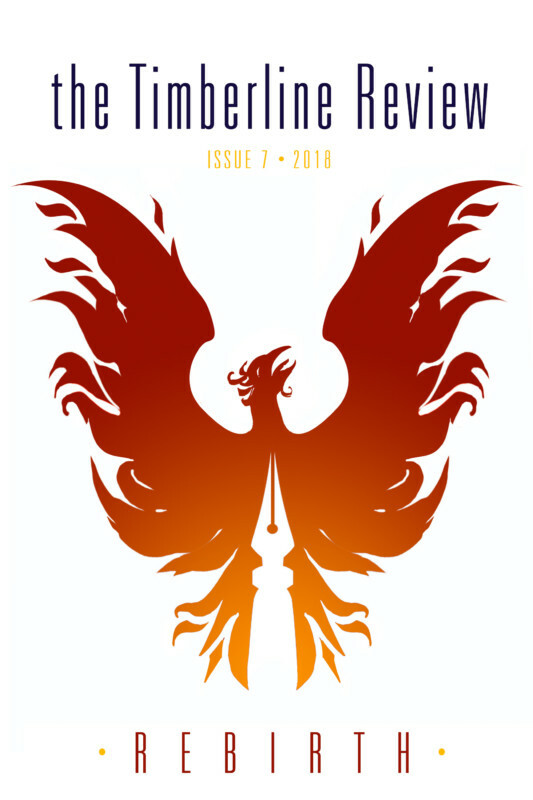 He’ll be writing an article telling us all about the experience later on. I also can’t wait to get his opinion of the finished movie! It was fascinating to hear the interactions between everyone, and how quickly they could shift scenes and sets. The Director of Photography, Phil Anderson of “Portlandia,” and Martin would toss ideas back and forth about different shots, discuss camera angles and potential problems, while Grip/Gaffer Eric Macey (who also worked on FiLMLaB films Alis Volat Propriis and Coffee, Table, Book) arranged spotlights, closeups, and turned a cloudy day into a sunny day at the beach. At one point, he cut up pieces of cardboard for some mysterious reason. I still don’t know why. Towards the end of filming the final scene, Martin made a comment about how it had a Downton Abbey camera shot. Everyone laughed. I totally did not get it! It was a geeky film joke! Also awesome. My favorite part though? The props. One of the characters gets beaten with a baguette. 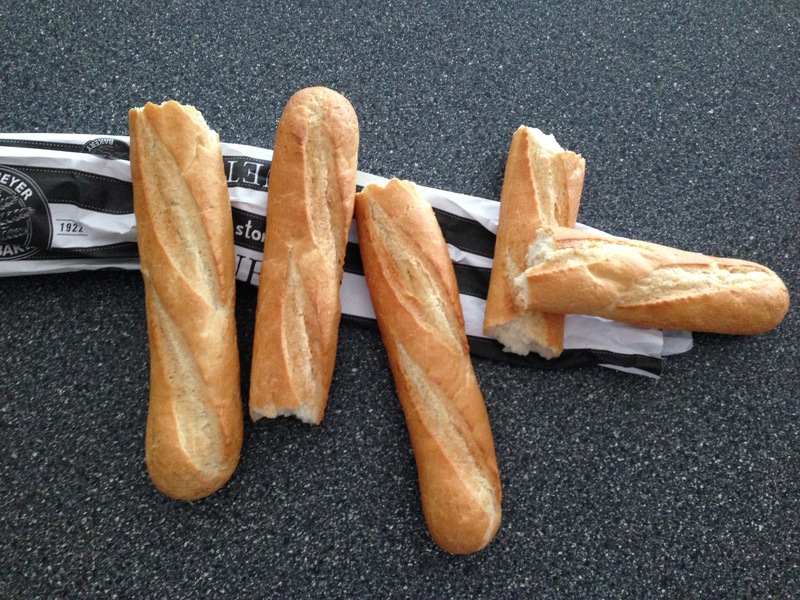 That required “stunt” baguettes. A lot of them. And they suffered. Painfully so, it looked like. Then there were the gnomes. Two of them because Ruth wasn’t sure which one Martin would like better. One of them made too much noise on set, too. Naughty gnome had to go stand in the corner for the rest of the day and think about what he had done. Last? The blue globe and “stunt” blue globe. 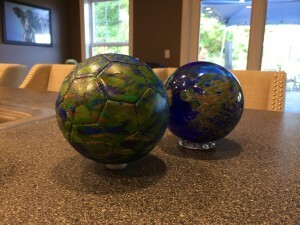 Alina’s daughter painted a small soccer ball so that it looked exactly (well–very, very nearly, anyway) like the blue globe that was a pivotal prop in the script. The drama around those three props alone made the whole day worthwhile to me. Actually, now that I think about it, the props weren’t my favorite part, after all. My favorite part was the applause. When the Paige and Tyson (“Sophie” and “Matt”) had finished up their final scene for the day, everyone applauded. The kids left with big grins on their faces and to applause. It was awesome. I nearly missed the final “It’s a wrap!” applause, but I at least caught the vibe at the end. Everyone was so happy and excited, and the long, exhausting day seemed suddenly worth every minute. Yeah. That was definitely my favorite part. So thank you to Martin, Alyssa, and all of the cast and crew for allowing me to witness and share in such a fantastic experience!